With WP Migrate DB Pro 1.9 the backups tab was introduced. This is an additional tab added to the user interface that lists database backups made during a migration. 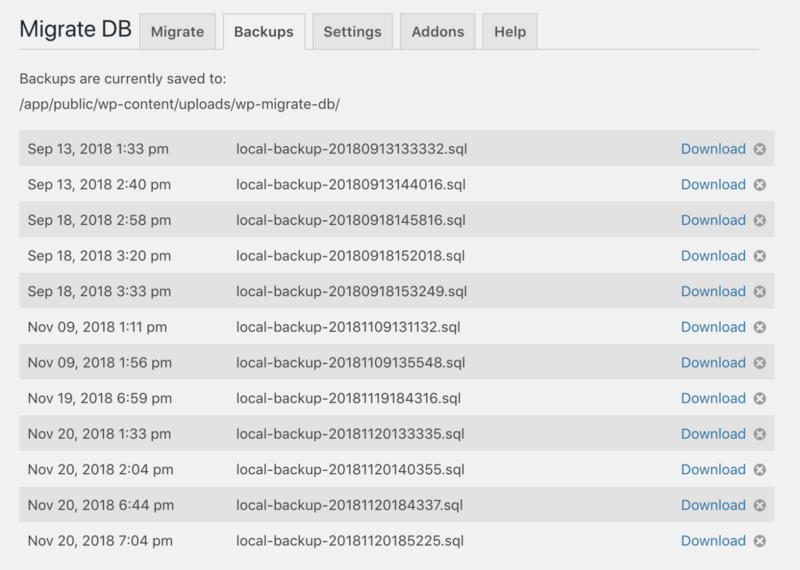 The backups you do with WP Migrate DB Pro aren’t meant to be a replacement for server-side site backups; rather, backing up your database right before you perform a migration can be helpful if something goes wonky in your workflow. It should be mentioned that these backup files are only of the database — uploads, themes and plugins are not backed up. For years we’ve had the option to backup either your remote or local database before running a push or pull. The backups tab aims to make managing these files easier. When you click on the backups tab you will see a list of all the database backups you’ve created during previous migrations. By default, these backups are stored in the /wp-content/uploads/wp-migrate-db/ folder. Each backup can be downloaded from this tab and then easily restored via WP Migrate DB Pro’s import feature or using a tool like phpMyAdmin or Sequel Pro.